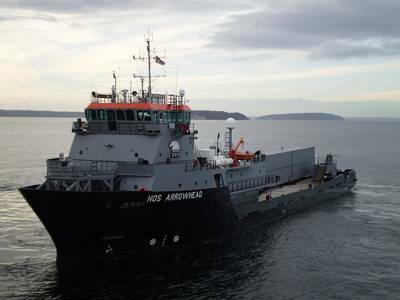 Hornbeck Offshore Services has closed the sale of three 250EDF class OSVs to the U.S. Navy, the company announced today. The three vessels were sold for cash consideration of $114 million, the company reported. This is expected to result in a gain on sale of assets of approximately $33.0 million ($20.8 million after-tax or $0.57 per diluted share). The HOS Arrowhead, the HOS Eagleview and the HOS Westwind have been supporting the Navy's submarine fleet on the east and west coasts since they were constructed in 2008 and 2009. In order for the Navy to continue receiving the capabilities of these vessels, Congress required their purchase from the Brooklyn-based offshore transport services provider. The proceeds from this transaction will be used for general corporate purposes that may include retirement of debt, funding for the acquisition, construction or retrofit of vessels or discretionary share repurchases, the company said in a statement. The vessel purchase agreement includes an option for the acquisition of a fourth vessel currently under charter to the U.S. Navy, the HOS Black Powder, that, if exercised as anticipated, would bring the aggregate sale amount to $152 million, which is expected to result in an aggregate gain on sale of assets for the four vessels of approximately $44.0 million. In addition to these vessel sales, the company separately entered into an operations and maintenance ("O&M") contract for the three vessels sold, which contains an initial term and annual renewal options spanning a 10-year operating period including annual dayrate escalations. Associated with the O&M contract, the company was also awarded a time charter for the HOS Black Powder that will remain in effect until the closing of the anticipated sale of the vessel pursuant to the U.S. Navy purchase option is completed. Hornbeck expects to complete the sale of HOS Black Powder by the end of the third quarter of 2015, subject to government funding, and all guidance estimates included below reflect an assumed sale date of September 30, 2015.